In the wake of challenging times faced by the logistics industry, Almajdouie Logistics Company (MLC) has undergone a complete reform of its organisational structure right down to the operational processes, focusing on developing its human capital and transforming its leadership. As the logistics industry continues to face tough times ahead, MLC is gearing up to take on the challenge of accepting and acting upon the changes. Having managed through a tough and challenging 2016, Baheej Biqawi, MLC chief executive officer looks forward to 2017 with a positive attitude toward unlocking strategic sectors where MLC can increase its participation, in terms of investing in new assets and services. One of the great success stories in the Middle East and North Africa (Mena) region, MLC offers complete onshore services ranging from transportation and freight forwarding to warehousing solutions and caters to diverse industries including oil and gas, petrochemical, infrastructure, utilities and fast moving consumer goods (FMCG). Some 60 per cent of its business comes from handling logistics for the petrochemical and oil and gas industries, 20 per cent for FMCG and 20 per cent from others. The company, which celebrated its golden jubilee in 2015, has one of the largest transportation fleets in the Middle East, terminals in key areas in Saudi Arabia and joint ventures and strategic partnerships with experienced international firms. By the same token, Brent Melvin, MLC Growth and Innovation manager gives his view on how effective MLC’s strategy has been, as he admits that the unfavourable economic conditions were a catalyst for change, which was required for the business to continue growing. 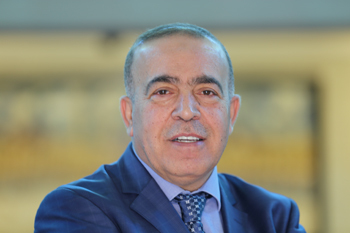 Reflecting on the main elements of success, such as restructuring, diversifying and developing its people, he explains, “We have undergone a complete reform from our organisational structure down to the operational processes.” In light of the unveiled visions by GCC governments, he sees it as an opportunity to unlock strategic sectors where logistics service providers can increase their participation in terms of projects or identifying new services and ideas to meet governments’ objectives. For example, Saudi Arabia›s 2030 vision entails engaging the private sector investment in developing logistics hubs and this in its turn fits with MLC›s own strategy of owning and operating strategic assets, since MLC has the financial resources as well as the technical expertise. As a key regional player, MLC has been providing cross border services to customers in the various GCC countries, handling various key projects, as well as operating successful joint ventures (JVs) with Sinotrans in Jebel Ali (MaxxLogistics) and in Saudi Arabia (Sinotrans Almajdouie Middle East), with AlKazmi in Kuwait (MK Logistics), with De Rijke (MDR) and with Sumitomo Warehousing Co. (RPL) and Al Badia in Qatar. The company has been active in supporting the cross trade between Saudi Arabia and GCC countries long before these nations have transformed to the vibrant countries they are today. While MLC is able to utilise a pool of assets available around the GCC, it also has the potential to sell across its product portfolio. In terms of investment, acquiring additional assets or operating its current extensive fleet, it is determined by the length of contracts, number of assets required and ongoing opportunities in an area. Biqawi further stressed that any progress or development in a company stems from the importance of its human capital and its leadership skills. In such changing times, accepting change is usually the primary challenge for many members of the organisation. Business leaders who just wait and then attempt to react to current events will not thrive for very long. He added that change is disruptive and takes staff out of the ‘comfort zone’ – the habits of doing things the way they are used to whether right or wrong. 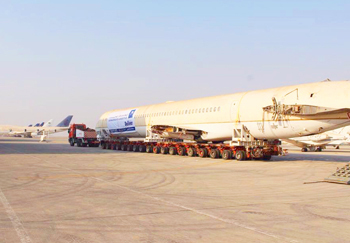 MLC recently planned, executed and managed the complex move of a retired MD90 aircraft from Jeddah International Airport to Riyadh. To prepare for the journey estimated to take 8 to 10 days, MLC conducted a series of road tests before preselecting a route that would take the twin-engine, short-to medium-range, single-aisle commercial jet airliner, along approximately 1200 km of roads over five days safely, it said. The challenging move had to overcome the height limitation of the aircraft when placed on the trailers (exceeding 5.5 m). In addition, the cargo had other obstacles, such as the sphere shape and the location of the tyres, making it difficult to lash to the trailers. “The successful move of the 43 m aircraft weighing 40 tonnes was another fine example of the ingenuity of our team and the collective contribution we provide to our clients,” he added.